My first stop in Viet Nam was Ho Chi Minh City also known as Saigon. 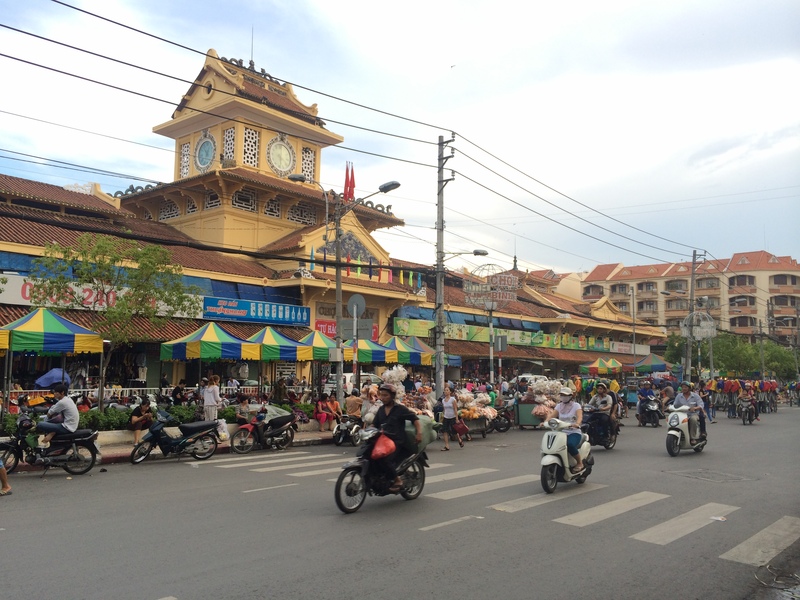 It used to be the capital of South Vietnam and has about 10 million residents. My flight arrived at 2 am and on the cab ride to my hostel, I quickly realized that I was in a very different place than Hong Kong. Nobody in Saigon followed the traffic rules. At every red light, the driver put on his brights, honked his horn, and hoped for the best. Eventually, we made it. 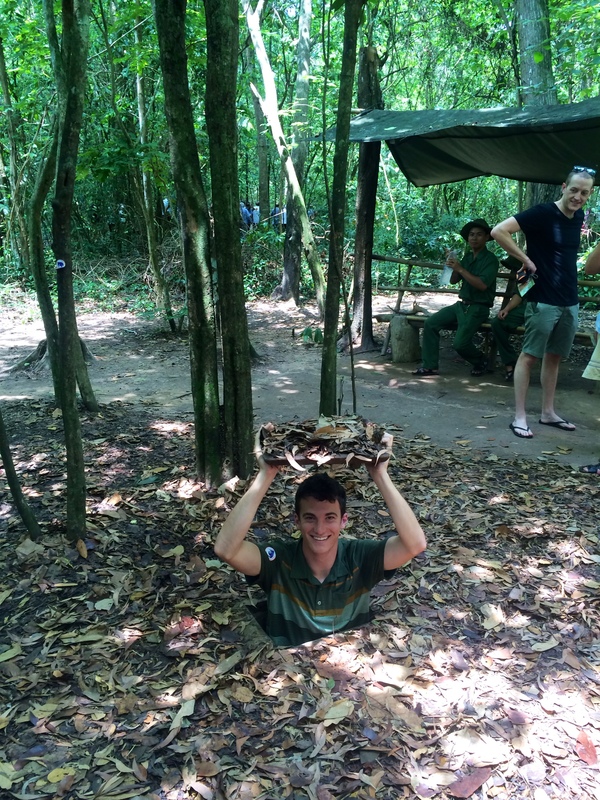 The next day, I got up early, just in time to go on a bus tour to the Cu Chi Tunnels. The tunnels, were about 1 1/2 hours away from the hostel. The tunnels were originally built during the French-Vietnamese War in the 1950’s and were expanded during the US-Vietnamese War. The tunnel network extended for 500 km all the way from Saigon to Cambodia. During the war, 50,000 Vietnamese lived underneath the tunnels for months at a time to fight the Americans, which is unbelievable given the size of the tunnels. They were designed to be “Asian-sized”, that is too big for Americans to fit. The guide also said that because the Vietnamese were used to squatting to go to the toilet, they had flexible enough legs that they could actually squat-walk through the tunnels while carrying a gun. While I was barely able to move through the tunnels, other people on the tour couldn’t do it. 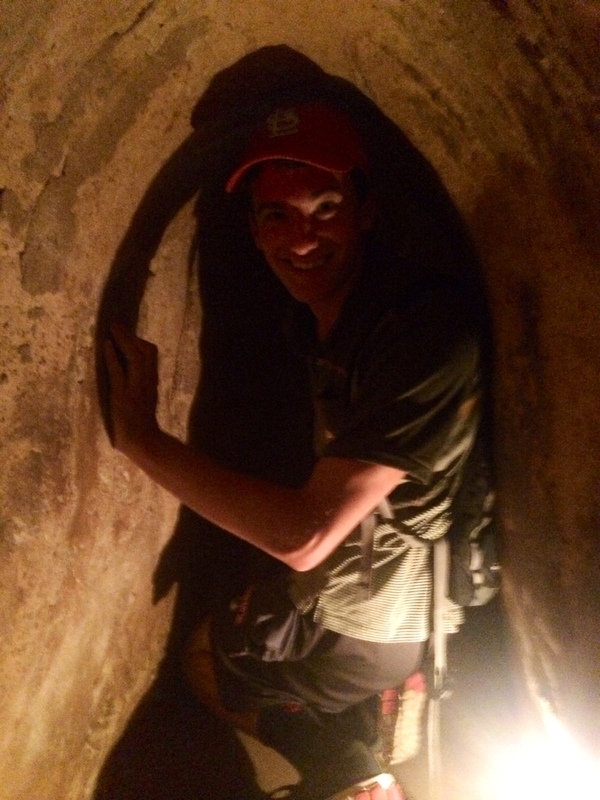 Everyone was really impressed that I was able to make it through the American-proof tunnels. 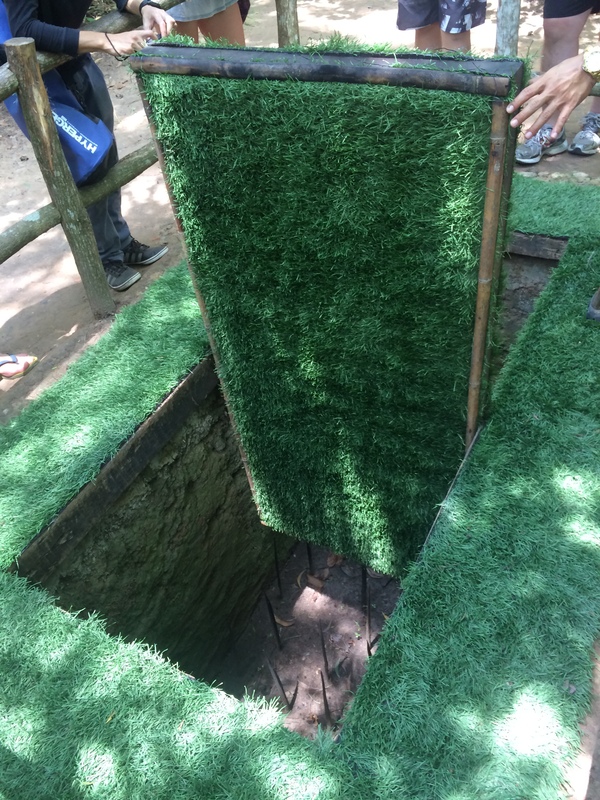 The guide also showed us the many types of spike traps laid by the Vietnamese and were used to kill the Americans. These were hunting traps that the locals have been using for over 2,000 years. They were terrifying. Because of this amazing network of tunnels, the Vietnamese could strike anywhere at anytime, which gave them an huge advantage over the Americans. Add in the knowledge of the territory and the US really did not have a chance here. Replica of a hunting trap. The trap would normally be half-covered in water so the spikes are hidden. I felt really awkward being an American here. At the end of the tour, the guide showed us a Communist-made documentary in the English language. The documentary described the many ways that the local farmers killed the Americans and profiled lots of people who became heroes for killing Americans. The phrase “Killing Americans” was used at least 50 times during the movie and every time I felt an uneasiness in my stomach. That said, the Vietnamese described the war as them repelling an American invasion of their country, which is in fact true. We are proud of our war heroes, so I suppose they should be as well. I was never singled out for being an American on the tour and all of the Vietnamese I talked to said that the war is over and Vietnam needs to be friends with everyone to improve their economy. After the tunnels, I walked from my hostel to the War Remnants Museum. Walking in Saigon is like playing the world’s largest real-life game of Frogger. Saigon has 5 million motorbikes and every street has hundreds (no exaggeration) of motorbikes coming from both directions (no freeways here). In order to cross the street, you have to wade across the many lanes of traffic. The key is to go slowly and steadily through the waves of motorbikes and then hope for the best. Because the motorbikes are going pretty slowly as well (not more than 20 mph), they have a good amount of time to dodge you. 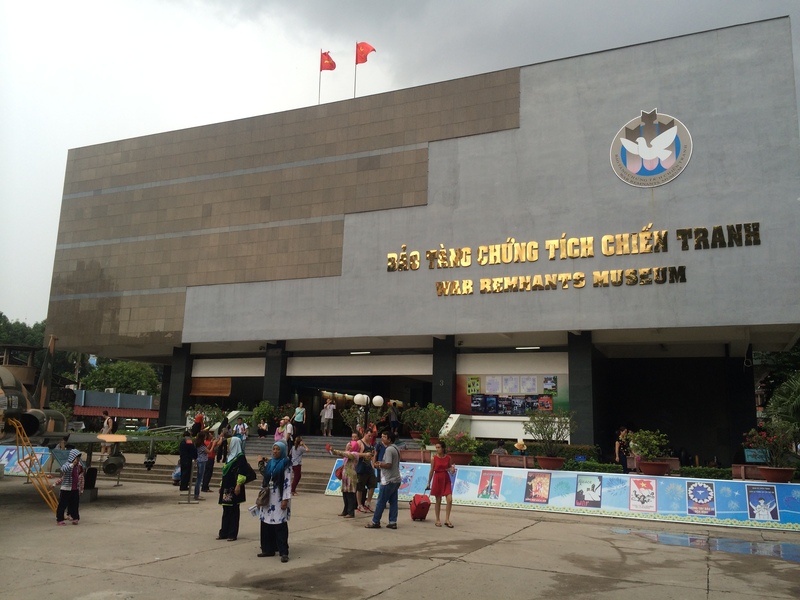 Eventually, I made it to the War Remnants Museum, which is a Vietnam War Museum… in Vietnam. As a result, everything in the museum showed how terrible the US is (mainly in pictures). The ground floor had propaganda posters and pictures from anti-war protests around the world. The point of this exhibit was to show that the entire world was against the war. The next floor showed the destruction caused by the US today through their use of Agent Orange, a chemical compound sprayed over Vietnam. Many people today whose parents were exposed to the chemical were born with horrible birth defects such as no limbs, deformed faces, or severe mental disabilities. Also on this floor were pictures of destroyed villages in Vietnam. The next floor showed pictures of the war itself including US soldiers torturing and killing Vietnamese children. The photos were taken by US journalists who were later killed in the war. While the museum mainly decided to let the photos do the talking (a picture is worth a thousand words), at the last floor did they make any kind of statement. The point was simple: Vietnam has a right to govern itself in whatever form of government it chooses and that the US had no right to interfere. After the museum, things started to get interesting. As I was walking back to the hostel, I was approached by lots of motorbike drivers asking me for a ride. After dismissing dozens of them, I finally accepted the offer from a man named Tuan, who had been a guide for 25 years. While driving around Saigon on a car is a nightmare due to the traffic, it is actually very pleasant on a motorbike. The streets are designed for the more compact motorbikes, so the traffic was actually not so bad. This is how most Vietnamese see the city and I really enjoyed taking in the sights and sounds of the city. Our first stop was the Chinese market in Chinatown, where I was the only white person in the entire market. 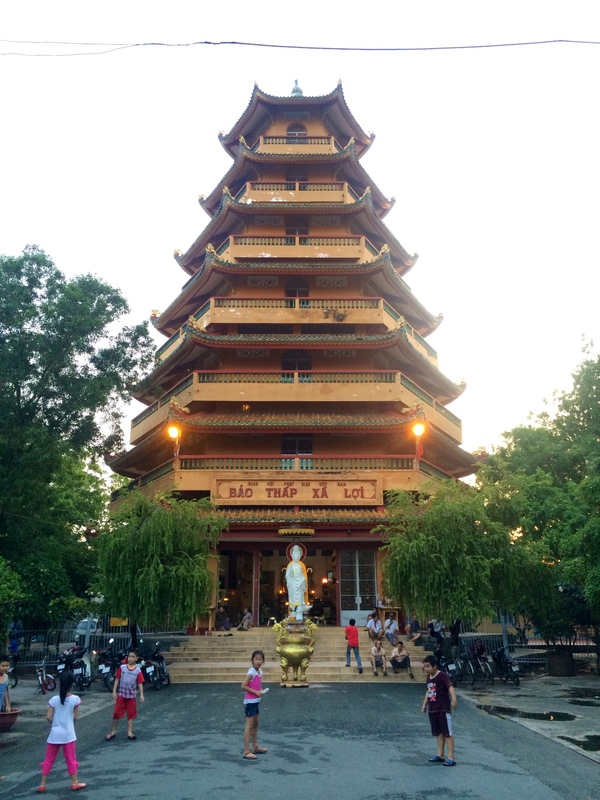 We then went to a Buddhist temple, the Xa Loi pagoda, where again I was the only Westerner. There, I helped a group of schoolchildren practice their English. After that, he drove me back. While I was scheduled to go on a bus tour of the Mekong Delta, I decided then to go with Tuan the next day to the Delta instead because I had such a wonderful time on the motorbike. Another amazing educational experience . navigate totally strange new worlds. So interesting. Keep ’em coming.